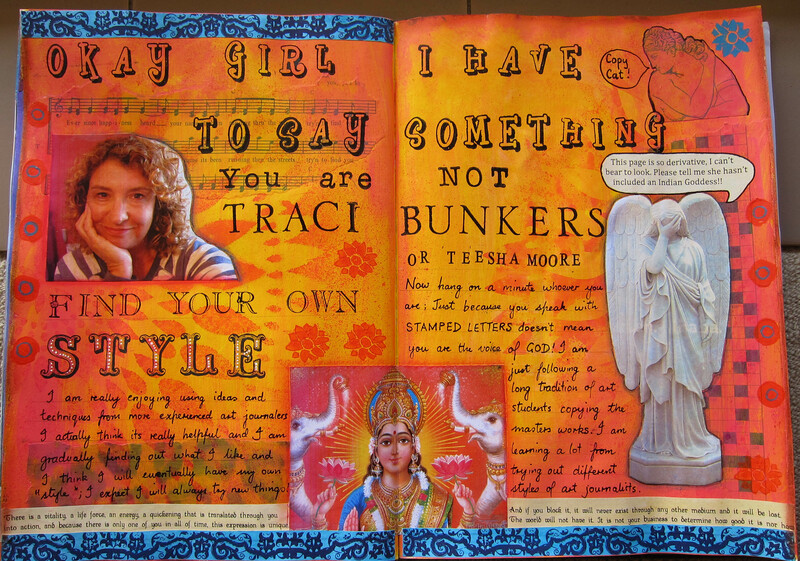 This entry was posted in Art journal and tagged "art journal", "copy cat", "Traci Bunkers", 21 secrets by Alison. Bookmark the permalink. Love your article! I agree with you, one of the best ways for artist to learn a new skill or technique is directly from those who have come before us. As long as we credit them and don’t seek to make a profit, I think it is an effective strategy to build confidence. I really like your honesty on this page. So many times, especially for those of us beginning to create, we question our talent and significance. I look forward to watching you find your own style and voice! I’m taking 21 secrets, too. Did you do Martha Lever’s credit card flowers? I love that one. Haven’t done Tracy’s class yet. Love your page! Hey Allison, welcome to the blisfully art journaling group. Your journal pages look fabulous! 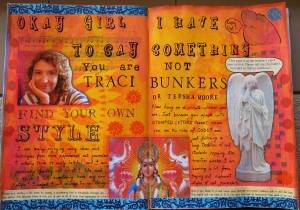 That is an amazing Traci Bunkers page! I have her book too and love her style. I just ordered some of her stamps. I also beat myself up about copying but then someone pointed out to me that all the great masters started by copying other masters, and we all practice other people’s music and don’t think a thing of it. (-: I am in Dina Wakely’s class and taking an abstract painting class by Flora Bowley (book: Brave, Intuitive Painting)…she is in Australia as we speak I believe. 3 more school days (I am a teacher) and then let the paint fly! Sorry to be so chatty (coffee this morning) but so enjoyed your discussions and your blog.